The second season of “Friends” is actually better than the first with some great storylines, like the Ross/Rachel relationship getting ratcheted up and Monica getting involved with an older man. The comedy is gold and you begin to see how the series would run as long as it did. The Blu-ray is light in features but the video and audio transfers are on the acceptable level and are on par with what’s seen on TBS syndication. 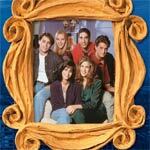 The first season of “Friends” is funny and has some great storylines. Often times, when series with ensemble casts start, they have a difficult time devoting time to each character but in this case the premiere was fantastic and the success continued through the season finale. The Blu-ray is light in features but the video and audio transfers are on the acceptable level and are on par with what’s seen on TBS syndication. It’s a shame that The Other Woman didn’t quite come together. I thought Natalie Portman once against puts on a good and even brave performance but everything else around her from the supporting cast (mainly the miscasting of a love interest) to the story itself doesn’t help matters.